Auto Purple Amnesia exhibits explosive growth from 3 weeks and will shoot up to around 80cm (32 inches) very rapidly. This strain likes to branch out, so with some encouragement and space you will end up with numerous bud sites. Auto Purple Amnesia produces lovely lime green buds with purple hues that give off a citrus aroma that is wonderfully sweet. 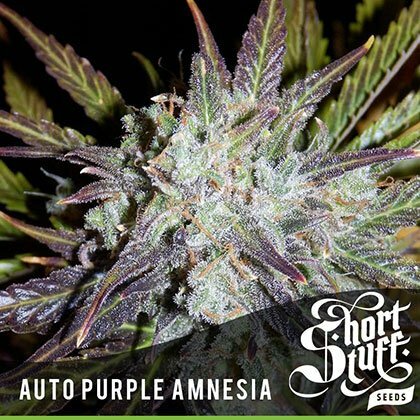 This strain has recently broken auto-flowering records with one plant producing 683g of dried buds of the highest quality when grown as part of an independent strain test on the autoflower network –https://www.autoflower.net/forums/f154/auto-purple-amnesia-short-stuff-seeds-boutique-line-39769-12.html. Auto Purple Amnesia is part of ourBoutique Line of cutting edge Autoflowering cannabis genetics.The Boutique Line contains the most up to date autoflowering genetics which are pushing the boundaries of what can be done with autos. All the strains in the Boutique Line are big, tall, heavy-yielders and have been produced in-house by Shortstuff’s master breeders.